When it comes to the noisy bits, the Pure Jongo S3 crams four 19.05mm high frequency drivers and an upward-firing 88.9mm mid-bass driver and a 20W amplifier into its rounded rectangular cuboid body. Around the back you'll find a 3.5mm auxiliary input, power port and a USB-port which is used to host the external Bluetooth dongle. Plus recessed audio and Wi-Fi buttons and a 25.4mm non-backlit LCD. The front houses the power button, volume controls and a mute button. The Pure Jongo S3 itself feels solid and pretty tough, with cloth covering speakers on the side and metal grille protecting the upward-firing mid-bass driver on the top. The whole thing weighs 1.25kg or a little heavier than a bag of sugar - making it relatively easy to cart around. As we've already mentioned, the Pure Jongo S3 includes both Wi-Fi (802.11b and 802.11g) and Bluetooth A2DP and you can even buy an optional Ethernet adapter if you want to use a wired connection instead. Sound-wise, the Pure Jongo S3 supports WMA, AAC, MP3 and MP2 audio codecs as well as regular analogue audio, of course. The Pure Jongo S3 is relatively straightforward to setup. The power button on the front has a glowing light surround which changes to red, green or amber depending on what state it's in. Getting the Jongo S3 to play sound from your smartphone via Bluetooth is easy to do, as is using the regular 3.5mm analogue audio input. But it's only when you fire up the Wi-Fi option that the Pure Jongo S3 begins to disappoint. The first bit, getting it setup on your network is easy, but it's then that you hit the device's somewhat arbitrary limitations. You can't just stream music to it from your computer or hi-fi, for example, and the only way to listen in using your iPhone, iPad or iPod touch is to download the free Pure Connect app from the iTunes Store - there's no equivalent of AirPlay here. A mobile app for Android users is promised soon. This also means you have to use music in your iTunes library - you can't stream the likes of Spotify or Rdio over WiFi, but you can do so using Bluetooth or the 3.5mm physical connection. As well as enabling you to stream music you own, the Pure Connect app also invites you to sign up to Pure's suite of music portals. Some of these - internet radio and on-demand listening - are free, but the app's constructed in such a way that you'll soon be tempted by the paid-for offerings, such as Pure Music, which charges £4.99 a month. When it comes to sound quality the Pure Jongo S3 is about as good as you'd expect from a small unit like this. If you're happy to listen to music at relatively low volumes and in small rooms, then the speaker is good company delivering sounds with reasonable fidelity. As befits a company chiefly known for making DAB receivers, the Jongo works best when handling radio broadcasts - particularly spoken word and classical - and internet streams, but things fall apart very quickly the minute you crank the volume. The forthcoming bigger-brother Jongo T6 will likely add a more meaty sound to the range, but still, we've played with speakers this size that sounded better. We also found when listening to our tunes via Wi-Fi that playback suffered occasional dropouts, while volume adjustment using the Pure Connect app wasn't subtle. 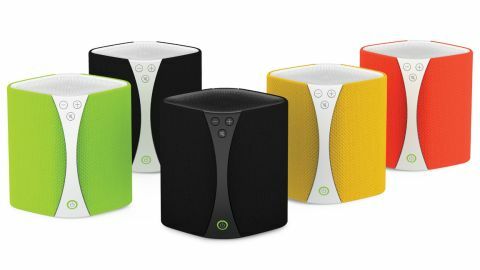 The Jongo S3's headline feature is multi-room audio. In theory you can put one in every room in the house and have them all synced up, playing the same music in unison. This is very easy to set up and works flawlessly, using one of the units as a master which connects to all the others. It's a great way to enjoy music while you're pottering around at home - doesn't matter which room you wonder into, you're not going to miss that amazing skip-beat at 2 minutes 15 in Susan Cadogan's Hurt So Good. There's no wireless n in the Jongo though, which could cause you problems if you have a big house or one with thick, wi-fi-hating walls. It's lack of inclusion is a bit of a mystery. Multi-room only works using Wi-Fi mode - Bluetooth only allows you to play to one Jongo. It's a more basic, straight forward multi-room system compared to the likes of Sonos. You can't set up zones and have different music streaming to each one over Wi-Fi unless you stream to them all separately with different devices. However, Pure reckons that no one really wants to set up zones anyway. Either way, this approach is certainly a lot easier to set up and use than Sonos and its ilk. The Pure Jongo S3 is a great idea in theory, but we can't help but feel a little let down by it. The sound quality is disappointing - and the fact that you can only stream music over Wi-Fi by using the sales-pushing Pure Connect app is a birrova slap in the face. That said, the multi-room features work nicely and offer a slightly better value set up than Sonos.